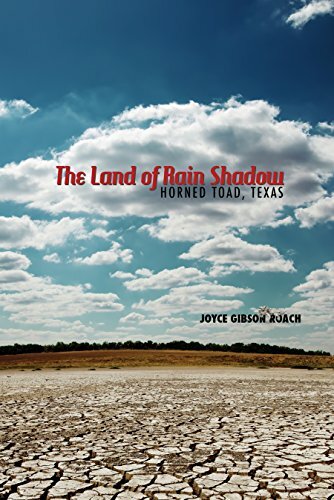 The short stories in The Land of Rain Shadow: Horned Toad, Texas, are not in any chronological order, but move back and forth in time, humorous, and sometimes poignant sketches of sincere, occasionally eccentric individuals of different ages and races who share this bare-bones land. They are not always comfortable in their own skins as illustrated in “Just As I Am,” narrated by fourteen-year-old Annie about the Revival in 1938. Ms. Roach covers small town Texas patriotism in “The Day After Pearl Harbor,” but in a very different way. Ada, a lady approaching spinsterhood if she has not already arrived, takes advantage of a sale on permanent waves, which were done in 1941 by hooking up curlers to an electrical current. If Vetalou, the beauty operator had not been so upset by the attack on Pearl Harbor, and the fact her brother was in the Navy, Ada would never have sustained her injury. The injury and the brief glimpses of life on the home front are both humorous and poignant. They find help and live out their lives against the backdrop of Crucero Ranch, arriving when the ranch is thriving, and find their final resting place in its cemetery, by then the only reminder that once Crucero was a place of hope before predatory land developers bought it. The story is a portent of modern day West Texas, where the number of water-tower towns are diminishing, and grandchildren and great-grandchildren are selling off the land where their hardy ancestors once flourished in their own stubborn, independent way. Using the regional vernacular of West Texas as it was once spoken, Roach introduces an area almost unknown outside of the Southwest, and does not in eloquent fashion. While many will not appreciate these stories—too colloquial, too exaggerated—fans of regional fiction and humorous tales underpinned by poignancy and history will find The Land of Rain Shadow: Horned Toad, Texas an unexpected treasure.